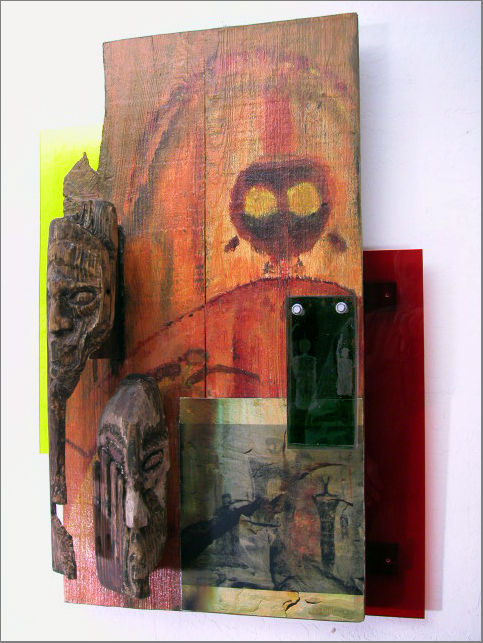 “Sego Canyon, Combine D2” (multimedia) wall-hanging derives from ancient, native American pictographs. Sego Canyon pictographs are probably about 700 years old. These paintings on desert stone are loosely (and incorrectly) characterized) as Anasazi. It is more likely that these were made by unknown tribe(s) after the Anasazi disappearance from the Colorado Plateau (circa 1100 – 1275 c.e.). Significantly, the style of the Sego panels is clearly influenced by the 5,000 year old pictographs in Barrier Canyon — about 100 miles distant.